Across the nation’s fourth-largest city and suburbs many miles away, Harvey left families scrambling to get out of their fast-flooding homes. 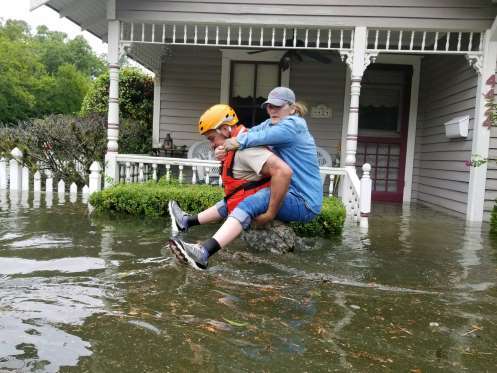 Rescuers — in many cases neighbors helping neighbors — in fishing boats, huge dump trucks and even front-end loaders battled driving rains to move people to shelter. Some used inflatable toys to ferry their families out of inundated neighborhoods, wading through chest-deep water on foot while the region was under near-constant tornado watches. 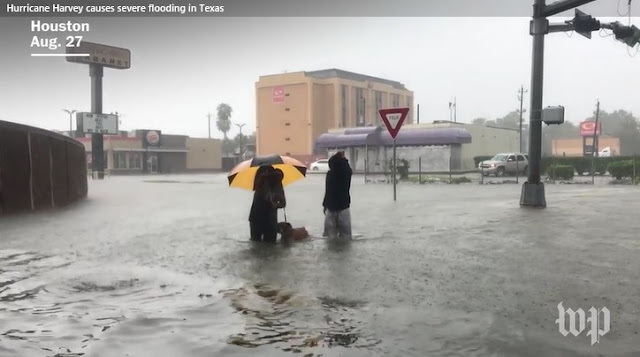 By Sunday afternoon, the National Weather Service — which tweeted the “beyond anything experienced” description that morning — was predicting that parts of Texas could receive nearly 50 inches of rain, the largest recorded total in the state’s history. It also warned that Harvey’s relentless downpours were expected to continue until late in the week and that flooding could become much more severe. More than 82,000 homes were without electricity in the Houston area by Sunday night as airports shuttered and hospitals planned evacuations. Thousands of rescue missions have been launched across a large swath of Texas, and Gov. Greg Abbott (R) said Sunday that more than 3,000 National Guard troops had been deployed to assist with relief efforts. The Federal Emergency Management Agency said federal agencies have more than 5,000 employees working in Texas, and the White House said President Trump plans to visit flood-wracked areas of the state on Tuesday. Officials said Houston, a major center for the nation’s energy industry, had suffered billions of dollars in damage and would take years to fully recover. Oil and gas companies have shut down about a quarter of oil and gas production in the Gulf of Mexico. Spot prices for gasoline are expected to jump on Monday, but the full extent of damage will not be clear for days, companies and experts said. In Austin, the Wilhelmina Delco Center, currently one of two Red Cross shelters in the city, had about 180 evacuees. Capacity is 300. Rain continued to fall steadily in Austin on Sunday, and river levels continued to rise. Precautionary sandbags were stacked against the shelter’s entrance. Bristel Minsker, communications director for the Red Cross Central and South Texas region, said “things are changing quickly,” as the organization prepares to scale up operations in the areas between Austin and Houston. Still, much of the nation’s focus remained squarely on Houston, where the massive scale of the flooding and the potential for the situation to get much worse in the days ahead was reminding many spooked residents of the effects of Hurricane Katrina on New Orleans. Mayor Sylvester Turner and other officials pleaded with residents to “shelter in place” and to make calls to overwhelmed 911 operators only in life-threatening emergencies. They urged people to climb to their roofs to await shelter if water was rising inside their homes, and local television news anchors reminded people to stay out of attics where they might be trapped by rising water — or to at least bring an ax to hack their way to the roof. Police began to ask people with high-water vehicles and boats to assist in their rescue efforts on streets where abandoned cars were completely submerged. Brays Bayou, a huge waterway crossing the southwestern part of the city, rose between 10 and 20 feet overnight and by Sunday morning was flowing over bridges in its path. The Texas National Guard has deployed across the state, including engineers in Corpus Christi and an infantry search and rescue team in Rockport. Another search and rescue unit is staging in San Antonio and likely will be deploying to affected areas shortly, officials said. Downtown is seen in rain and clouds in Houston on Sunday. Rising water from Hurricane Harvey pushed thousands of people to rooftops or higher ground.© Jabin Botsford/The Washington Post Downtown is seen in rain and clouds in Houston on Sunday. Rising water from Hurricane Harvey pushed thousands of people to rooftops or higher ground. As the extent of the disaster became clear at daylight Sunday, some criticized Houston officials for not calling for an evacuation of the city. Turner defended the decision not to evacuate, noting it would be a “nightmare” to empty out the population of his city and the county all at once. Trump praised the way the city’s officials are handling the flood, tweeting at 8:25 a.m. that the “Good news is that we have great talent on the ground.” He promised to head to Texas “as soon as that trip can be made without causing disruption. The focus must be life and safety.” Trump signed a disaster proclamation for Texas on Friday night. By 7 a.m. Central time, the National Weather Service had recorded close to 25 inches of rain around Houston. Warnings for flash flooding and tornadoes remained in place across the region, and storm surges are expected along the coast, bringing flooding to typically dry areas. The National Weather Service said Sunday that at least five people had been reported dead due to Harvey. Local officials have confirmed that at least three people have died as a result of the storm, and officials in the hardest-hit counties expect that as the waters recede the number of fatalities will rise. The first reported death came Saturday in Rockport. Officials said one person was killed after their house caught fire during the storm and they became stuck inside. A resident transports his pets and belongings on an air mattress along Mercury Drive as he flees floodwater at his home in Houston on Sunday.© Jabin Botsford/The Washington Post A resident transports his pets and belongings on an air mattress along Mercury Drive as he flees floodwater at his home in Houston on Sunday. At about 9:15 p.m. on Saturday, rescue workers in southwest Houston recovered the body of a woman believed to have driven her car into floodwaters before attempting to escape on foot. Just two minutes earlier, police about 40 miles southeast in La Marque found the body of a 52-year-old homeless man in a Walmart parking lot where there had been high water. “The advice is if you don’t have to be out, don’t be out,” said Bill Begley, a spokesman with the Joint Information Center in Houston. He said most of the calls for help it had received have come from residents who tried to drive through the storm and got stuck in high water. By midmorning, Nichelle Mosby stood up to her knees in floodwater in the parking lot, grimacing with a towel over her head to block the rain. Mosby and six family members, including a 4-year-old girl, had come from Louisiana to visit relatives. When Harvey hit, they booked into the Courtyard. Now they were stranded with dozens of other guests. Local television station KHOU went offline while covering a live rescue of a driver in an semitrailer stuck in more than 10 feet of water near the Interstate 610 loop. The reporter was able to flag down a rescue crew, but as the rescue was about to take place, the station went dark. The main office said the station had to evacuate because floodwaters rushed into the building. About 500 people escaping Harvey are now living in two shelters in Dallas, 240 miles north of Houston. Sullivan reported from Houston, Samuels reported from Washington and Wax reported from Katy, Tex. Wesley Lowery, Thomas Gibbons-Neff and Steven Mufson in Washington; Justin Glawe in Dallas; Stephanie Kuzydym and Dylan Baddour in Houston; Tim Craig in Rockport and Corpus Christi; Brittney Martin in San Antonio; Ashley Cusick in New Orleans; Mary Lee Grant in Port Aransas, Tex. ; and Sofia Sokolove in Austin contributed to this report. 0 Response to "Full extent of Hurricane Harvey’s aftermath starts to come into chilling focus "